Aug 12, 2012 - Gavrilescu 2004; Volesky 2001). Biosorption ...... accumulation by rotating biological contactor (RBC) biofilms. J .... ron Sci Biotechnol 2:9â33. workers and assess their efficiency for different rnetal bearing solutions and industrial efiluents .... whether some others, such as Al, Ag, Cd, Sn, Au, Sr Hg, Ti. can remove heavy metals from aqueous solutions by biosorption. Although the complexity of the microor- ganism's structure implies that there are many ways for. ethanol production from the byproducts of Photosynthesis and fermentation using microbes like ... 6CO2 + 6H2O + solar energy → C6H12O6 + 6O2 ..... Anuja B, Saty awati S. Effect of some plant extracts on the hatch of M. Incognita eggs. Occurrence of 'overshoot's and impact on heavy metal removal has not been analyzed enough. .... their biosorption potential, and the vast majority of studies have been ..... let stream increases sharply and the effective life of the column is over ..
(incomplete metal removal, high reagent and energy requirements, generation of toxic sludge or other waste products). Most of these methods are often ineffective or uneconomical when heavy metal concentration is higher (10-100 mg/L) than permissible concentration less than 1 mg /L), which require a high cost when they used for disposal the heavy metals from aqueous effluents. Increasing environmental awareness and legal constraints being imposed on discharge of effluents are major factors for using cost–effective alternative technologies. In recent years, microbial biomass has emerged as an option for developing economic and eco-friendly wastewater treatment process., therefore, applying biotechnology in controlling and removing metal pollution has been paid much attention, and gradually becomes hot topic in the field of metal pollution control because of its potential application. Alternative process is a biosorption, which utilizes various certain natural materials of biological origin, including bacteria, fungi, yeast, algae, etc. . Biosorption can be defined as the ability of biological materials to accumulate heavy metals from wastewater through metabolically mediated or physico-chemical pathways of uptake . Biosorption, which is the ability of certain microbial biomaterials to bind and concentrate heavy metals from even the most dilute aqueous solutions, offers a technically feasible and economically attractive alternative . „Biosorption‟ has been defined as the property of certain biomolecules (or types of biomass) to bind and concentrate selected ions or other molecules from aqueous solutions . Algae, bacteria and fungi and yeasts have proved to be potential metal biosorbents . It is consider an ideal alternative method for removing contaminates from effluents Biosorption is a rapid phenomenon of passive metal sequestration by the non-growing biomass/adsorbents. It has advantages compared with conventional techniques , some of these are listed: (low cost; high efficiency; minimization of chemical and or biological sludge; no additional nutrient requirement; regeneration of biosorbent; and possibility of metal recovery). The biosorption process involves a solid phase (sorbent or biosorbent; adsorbent; biological material) and a liquid phase (solvent, normally water) containing a dissolved species to be sorbet (adsorbate, metal). Due to the higher affinity of the adsorbent for the adsorbate species, the latter is attracted and bound there by different mechanisms. The process continues till equilibrium is established between the amount of solid-bound adsorbate species and its portion remaining in the solution. The degree of adsorbent affinity for the adsorbate determines its distribution between the solid and liquid phases . Biosorption process, in which microorganisms are used to remove and recover heavy metals from aqueous solutions, have been known for few decades but have emerged as a low cost promising technology in the last decades. In this process, the uptake of heavy metals and radioactive compounds occurs as a result of physico-chemical interactions of metal ions with the cellular compounds of biological species . As a result, the idea of the use of biomaterial for the uptake of heavy metals has been extensively studied for the last two decades. Biotechnological approaches can succeed in those areas and are designed to cover such niches. Microorganisms have evolved various measures to respond to heavy-metal stress via processes such as transport across the cell membrane, biosorption to cell walls and entrapment in extracellular capsules, precipitation, complexation and oxidation– reduction reactions [9-16]. They have proven capability to take up heavy metals from aqueous solutions, especially when the metal concentrations in the effluent range from less than 1 to about 20 mg/L . Besides, flexibility to handle the range of physico-chemical parameters in effluents, selectivity to remove only the desired metals and the cost-effectiveness are some added advantages of biological metal cleanup techniques. These factors have promoted extensive research on the biological methods of metal removal. This paper reviews the use of different types of bacteria, algae fungi and yeasts and its wastes as biosorbents to remove heavy metals from wastewaters; these biological biosorbents have a highly effective as well as reliable in the removal of heavy metal ions from wastewater. Hence, this work attempts to summarize recent studies in the removal of heavy metals using biological biosorbents published between 2000 and 2013. Equilibrium studies in biosorption of heavy metals using various kinds of biosorbents are also reviewed. II. The use of natural materials for heavy metals removal is becoming a concern in all countries. Heavy metals have been excessively released into the environment due to rapid industrialization and have created a major global concern. Heavy metal ions have great effects on all forms of life. Heavy metal pollution is one of the most important environmental problems today because of their toxicity, bio-accumulation tendency, threat to human life and the environment . Heavy metals are presented in nature and industrial waste water, so the presence of heavy metals in surface and ground water pose a contamination problem. Large number of industries can produce and discharge wastes containing different heavy metals into the environment. The main source of heavy metal pollution are metal plating, mining, smelting, battery manufacturing, tanneries, petroleum refining, pigment manufacture, printing paint manufacture, pesticides, etc. The term “heavy metal” is entirely applied to a group of metals (and metal-like elements) with density greater than 5 g/cm³, atomic number above 20 and is toxic or poisonous at low concentrations . The main elements that considered as a heavy metals are chromium(Cr), manganese(Mn), cobalt (Co), copper(Cu), zinc(Zn), molybdenum(Mo), mercury(Hg), nickel(Ni), tin(Sn), lead(Pb), cadmium(Cd), antimony(Sb), etc. Three kinds of heavy metals are of concern, including toxic metals (such as Hg, Cr, Pb, Zn, Cu, Ni, Cd, As, Co, Sn, etc. ), precious metals (such as Pd, Pt, Ag, Au, Ru etc.) and radionuclides such as U, Th, Ra, Am, etc. [1, 20]. Lead, mercury, cadmium and chromium (VI) are at the top on the toxicity list from among various metal ions, the first three, called “the big three”, are in the limelight due to their major impact on the environment . Heavy metals are natural components from the earth‟s crust. They cannot be destroyed or degraded. However, most of these heavy metals become toxic at high concentrations due to their ability to accumulate in living tissues. Removal of heavy metals from industrial wastewater is of primary importance. Cadmium, zinc, copper, nickel, lead, mercury and chromium are often detected in industrial wastewaters. Table 1 gives the main sources of heavy metal pollutants and its effects on human lives. A. Copper, one of the most widely used heavy mental, is mainly employed in, electrical, electroplating industries, and in larger amounts is extremely toxic to living organisms. The presence of copper (II) ions causes serious toxicological concerns, it is usually known to deposit in brain, skin, liver, pancreas and myocardium . Copper usually occurs in nature as oxides and sulphides. Copper is an essential substance to human life. Copper is found in a variety of enzymes and is used for biological electron transport. Like all heavy metals, it is potentially toxic, especially at high concentrations. Thirty grams of copper sulfate is potentially lethal in humans. In high doses, it can cause anemia, liver and kidney damage, and stomach and intestinal irritation. Wilson‟s disease, a disease that causes the body to retain copper can lead to brain and liver damage if untreated. Inhalation of copper produces symptoms similar to those of silicosis and allergic contact dermatitis. Copper normally occurs in drinking water from copper pipes, as well as from additives designed to control algal growth. The suggested safe level of copper in drinking water for humans varies depending on the source, but tends to be pegged at 1.3 mg/L according to the US Environmental Protection Agency. Too much copper in water has also been found to damage marine life. The observed effect of these higher concentrations on fish and other creatures is damage to gills, liver, kidneys, and the nervous system. Common oxidation states of copper include the less stable copper (I) state, Cu+, and the more stable copper (II) Cu2+ . Environmental contamination due to copper is caused by mining, printed circuits, metallurgical, fiber production, pipe corrosion and metal plating industries  the other major industries discharging copper in their effluents are paper and pulp, petroleum refining and wood preserving. Agricultural sources such as fertilizers, fungicidal sprays and animal wastes also lead to water pollution due to copper. Copper may be found as a contaminant in food, especially shell fish, liver, mushrooms, nuts and chocolates. Any packaging container using copper material may contaminate the product such as food, water and drink . In some instances, exposure to copper has resulted in jaundice and enlarged liver. It is suspected to be responsible for one form of metal fume fever . Containing is linked to an increase in lung cancer among exposed workers . B. There are two stable oxidation states of chromium found in the environment, Cr (III) and Cr (VI) which have contrasting toxicities, mobility and bioavailability. Chromium compounds of oxidation state Cr6+ are powerful oxidants. Chromium hexavalent (VI) compounds are used as pigments for Photography, and in pyrotechnics, dyes, paints, inks, and plastics. They can also be used for stainless steel production, textile dyes, wood preservation, leather tanning, and as anti-corrosion coatings. While Cr (III) is relatively innocuous and immobile, Cr (VI) moves readily through soils and aquatic environments and is a strong oxidizing agent capable of being absorbed through the skin. Trivalent chromium, Cr (III), is an essential element required for normal carbohydrate and lipid metabolism. C.
Lead is a heavy metal poison which forms complexes with Oxo-groups in enzymes to affect virtually all steps in the process of hemoglobin synthesis and porphyria metabolism . Toxic levels of lead in human have been associated with encephalopathy, seizures and mental retardation . D.
The most severe form of Cd toxicity in humans is “itai-itai”, a disease characterized by excruciating pain in the bone [29, 30]. Other health implications of Cd in humans include kidney dysfunction, hepatic damage and hypertension . However, it has been suggested that overall nutritional status (rather than mere Cd content of food) is a more critical factor in determining Cd exposure. Table 1 shows the sources and toxicity of certain metal ions. • Greatly improved recovery of bound heavy metals from the biomass; • Greatly reduced volume of hazardous waste produced. B.
Biosorption depends on many factors that can effect on it. Some of these factors are related to the biomass and metal and the others are related to environmental conditions. The major factors that affect the biosorption process are: 1) Temperature: In contrast to bioaccumulation process, biosorption efficiency remains unaffected within the range 20-35 ᵒC, although high temperatures, e.g. 50 ᵒC, may increase biosorption in some cases, but these high temperatures may cause permanent damage to microbial living cells and then decreasing metal uptake [7, 48]. Adsorption reactions are generally exothermic and the extent of adsorption increases with decreasing temperature. The maximum biosorption capacity for Ni and Pb by S. cerevisiae was obtained at 25 ᵒC and found to decrease as the temperature was increased to 40 ◦C . 2) Characteristics of Biomass: The nature of the biomass or derived product may be considered one of the important factors, including the nature of its application such as: freely-suspended cells, immobilized preparations, living biofilms etc. Physical treatments such as boiling, drying, autoclaving and mechanical disruption will all affect binding properties while chemical treatments such as alkali treatment often improve biosorption capacity, especially evident in some fungal systems because of DE acetylation of chitin to form chitosan-glycan complexes with higher metal affinities . Growth and nutrition on the biomass, and age can also influence biosorption due to changes in cell size, wall composition, extracellular product formation, etc. 3) The Surface Area to Volume Ratio: It may be important for individual cells or particles, as well as the available surface area of immobilized biofilms. In addition, the biomass concentration may also affect biosorption efficiency with a reduction in sorption per unit weight occurring with increasing biomass concentration . 4) Acidity: pH seems to be the most important parameter in the biosorption processes. Biosorption is similar to an ion-exchange process, i.e. biomass can be considered as natural ion-exchange materials which mainly contain weakly acidic and basic groups. Therefore, pH of solution influences the nature of biomass binding sites and metal solubility; it affects the solution chemistry of the metals, the activity of the functional groups in the biomass and the competition of metallic ions. Metal biosorption has frequently been shown to be strongly pH dependent in almost all systems examined, including bacteria, cyanobacteria, algae, and fungi. Competition between cations and protons for binding sites means that biosorption of metals like Cu, Cd, Ni, Co and Zn is often reduced at low pH values [51, 52]. Generally, the heavy metal uptake for most of the biomass types decline significantly when pH of the metal solutions is decreased from pH 6.0 to 2.5. At pH less than 2, there are minimum or negligible removal metal ions from solutions. The metal uptake increases when pH increases from 3.0 to 5.0. Optimum value of pH is very important to get a highest metal sorption, and this capacity will decrease with further increase in pH value. 5) Biomass Concentration: Concentration of biomass in solution affects the specific uptake . At a given equilibrium concentration, the biomass adsorbs more metal ions at low cell densities than at high densities . So electrostatics interaction between the cells plays an important role in metal uptake. At lower biomass concentration, the specific uptake of metals is increased because an increase in biosorbent concentration leads to interference between the bindings sits . High biomass concentration restricts the access of metal ions to the binding sites . 6) Initial Metal Ion Concentration: The initial concentration provides an important driving force to overcome all mass transfer resistance of metal between the aqueous and solid phases . Increasing amount of metal adsorbed by the biomass will be increased with initial concentration of metals. Optimum percentage of metal removal can be taken at low initial metal concentration. Thus, at a given concentration of biomass, the metal uptake increases with increase in initial concentration. 7) Metal Affinity to the Biosorbent: Physical/chemical pretreatment affects permeability and surface charges of the biomass and makes metal binding groups accessible for binding. It can be manipulated by pretreating the biomass with alkalis, acids detergents and heat, which may increase the amount of metal uptake . Examples Gram-positive bacteria (Bacillus sp., Corynebacterium sp., etc.). Gram-negative bacteria (Eschrichia sp., Pseudomonas sp., etc.). and Cyanobacteria (Anabaena sp., Synechocystis sp., etc.) Molds (Aspergillus sp., Rhizopus sp., etc.) Mushrooms (Agaricus sp., Trichaptum sp., etc.). and Yeast (Scaccharomyces sp., Candida sp., etc.) Micro-algae (clorella sp. Chamydomonas sp., etc.) and Macro-algae (green seaweed (Enteromorpha sp.,Codium sp.,etc. ), brown seaweed(Sargassum sp., Ecklonia sp., etc., and red seaweed(geildium sp., Porphyra sp., etc.)) Fermentation wastes, food/beverage wastes, activated sludges, anaerobic sludge, etc. Fruit/Vegetable wastes, rice straws, wheat bran, soybean halts, etc. Plant residues, sawdust, tree barks, weeds, etc. Chitosan-driven materials, cellulose-driven materials, etc. B. Factors Affecting Biomass Choice When choosing biomass, for large-scale industrial uses, the main factor to be taken into account is its availability and cheapness [5, 6, 67]. Considering these factors, native biomass can come from: (i) Industrial wastes, which should be available free of charge; (ii) Organisms easily obtainable in large amounts in nature; and (iii) Organisms that can be grown quickly or specially cultivated or propagated for biosorption purposes [6, 67]. Adsorptive pollutants like metals can be removed by living microorganisms, but can also be removed by dead biological material . Bacillus sp. Pseudomonas sp. Micrococcus sp. 3) Fungi: Fungi are one of the industrial fermentation waste biomass which is really excellent metal sorbets. So, fungi including yeasts have received increased attention. Fungi gives good efficient and economical for sequestering heavy toxic metals from dilute aqueous solutions by biosorption because: (i) It offers the advantage of having a high percentage of cell wall materials; (ii) It shows excellent metal binding properties; (iii) It is available in large quantities from the antibiotic and food industries; (iv) It provides an eco-friendly environment. Three groups of fungi have a major practical importance: the molds, yeasts and mushrooms. Filamentous fungi and yeasts have been used in many wastewater treatments to bind metallic elements. Fungi are found entirely in natural environments and important in industrial processes. The structure of fungi has a wide range of morphologies from unicellular yeasts to polymorphic and filamentous fungi; many of them have complex macroscopic fruiting bodies. Environmental conditions such as pH, temperature, etc. Based on location where biosorption occurs: in these criteria, biosorption mechanisms are classified as extra cellular accumulation/precipitation, cell surface sorption /precipitation and intra cellular accumulation. Biosorption of metals occurs mainly through several interactions such as physical adsorption, ion exchange, complexation, precipitation and entrapment in inner space . In the biosorption process, two types of biological cells (living and dead cells) as well as chemical pretreated biomass can be used. The metal ion uptake by living and dead cells can consist of two different modes. The mechanisms of uptake by living materials (bioaccumulation) and removal by dead ones (biosorption) are entirely different. PS: polysaccharides, UA: uronic acids, SPS: sulfated PS, AA: amino acids, Cto: chitosan, Cti: chitin, PG: peptidoglycan, PL: phospholipids, TA: teichoic acid, LPS: lipo, PS. VI. EQUILIBRIUM AND KINETIC STUDIES A. Biosorption Isotherms Biosorption is usually described through isotherm. Adsorption isotherm is relatively simple method for determining the feasibility of using a certain adsorbent material for a particular application. It is represented the equilibrium relationship between the adsorbate concentration in the fluid phase and the adsorbate concentration in the adsorbent particles at a given temperature. It is a plot of the amount of adsorbate per unit weight of adsorbent qe against the equilibrium concentration of the adsorbate remaining in solution Ce The quantity described is nearly always normalized by the mass of adsorbent to allow comparison of different materials . By knowing the adsorption isotherm, the affinity of the adsorbate for an adsorbent is quantified. For most applications in wastewater treatment, the amount of adsorbate adsorbed is usually a function of the aqueous-phase concentration . Some typical isotherm shapes are shown as arithmetic graphs as shown in Fig. 3 . From the above curves, it will be noted that the adsorption is specific property related to the nature of the adsorbate-adsorbent system . The application of the Elovich equation in liquid phase adsorption is gaining in popularity . Pseudo-second order kinetic model was applied on biosorption of lead onto dried activated sludge with correlation coefficient of 0.994 . It was found that pseudo-second order model could be represent the adsorption of lead onto GAC better than Elovich model with correlation coefficient of 0.994,0.726 respectively . Some researchers applied first and second-order-pseudo models in GAC adsorption of phenol. Pseudo-second order model fit the data with 0.998 correlation coefficient for the concentration of 1000 mg/L, and pseudo-first order model fit the data with 0.900 correlation coefficient for 100 mg/l concentration . VII. JL. Wang and C. Chen, “Biosorbents for heavy metals removal and their future a review,” Biotechnol. Adv., vol. 27, pp. 195-226, 2009. E. Fourest and J.C. Roux, “Heavy metal biosorption bu fungal mycelial by-product, mechanisms and influence of pH,” Appl. Microbiol. Biotechnol., vol. 37, pp. 399-403, 1992. F. Petersen, C. Aldrich, A. Esau, and BC. Qiiii, “Biosorption of Heavy Metals from Aqueous Solutions,” WRC Report, vol. 1, iss. 100, 2005. B. Volesky, “Biosorption and me,” Water Res., vol. 41, pp. 4017-4029, 2007. B. Volesky, “Advances in biosorption of metals: selection of biomass types,” FEMS Microbiol. Rev., vol. 14, pp. 291-302, 1994. Volesky B and Holan Z, “Biosorption of heavy metals,” Biotechnol. Progr., vol. 11, pp. 235-250, 1995. N. Ahalya, T. V. Ramachandra, and R. D. Kanamadi, “Biosorption of Heavy Metals,” Research Journal of Chemistry and Environment, vol. 7, pp. 71-79, 2003. A. Kapoor and T. Viraraghavan, “Biosorption of heavy metals on Aspergillus Niger: effect of pretreatment,” Biores. Technol., vol. 63, p. 109, 1998. LC. Rai, JP. Gaur, and HD. Kumar, “Phycology and heavy metal pollution,” Biol. Rev., vol. 56, pp. 99-151, 1981. LE. Macaskie and ACR. Dean, “Microbial metabolism, desolubilisation and deposition of heavy metals: metal uptake by immobilized cells and application to the detoxification of liquid wastes,” Adv. Biotechnol. Process, vol. 12, pp. 159-72, 1989. C. Huang, C. Huang, and AL. Morehart, “The removal of copper from dilute aqueous solutions by Saccharomyces cerevisiae,” Water Res., vol. 24, pp. 433-439, 1990. SV. Avery and JM. Tobin, “Mechanism of adsorption of hard and soft metal ions to Saccharomyces cerevisiae and influence of hard and soft anions,” Appl. Environ. Microbiol., vol. 59, pp. 2851-2586, 1993. D. Brady and JR. Duncan, “Chemical and enzymatic extraction of heavy metal binding polymers from isolated cell walls of Saccharomyces cerevisiae,” Biotechnol. Bioeng., vol. 44, pp. 297-302, 1994. D. Brady, AD. Stoll, L. Starke, and JR. Duncan, “Bioaccumulation of metal cations by Saccharomyces cerevisiae,”Appl. Microbiol. Biotechnol., vol. 41, pp. 149-54, 1994. P. Krauter, R. Martinelli, K. Williams, and S. Martins, “Removal of Cr(VI) from ground water by Saccharomyces cerevisiae,” Biodegradation, vol. 7, pp. 277-286, 1996. F. Veglio and F. Beolchini, “Removal of metals by biosorption: a review,” Hydrometallurgy, vol. 44, pp. 301-316, 1997. CL. Brierley, “Bioremediation of metal-contaminated surface and ground- water,” Geomicrobiol. J., vol. 8, pp. 201-213, 1993. JC. Igwe and AA. Abia, “Maiz Cob and Husk as Adsorbents fot removal of Cd, Pb and Zn ions from wastewater,” The Physical Sci., vol. 2, pp. 83-94, 2003. N. Raut, G. Charif, Amal Al-Saadi, Shinoona Al-Aisri, and Abrar Al-Ajmi, “A Critical Review of Removal of Zinc from Wastewater,” Proceedings of the World Congress on Engineering, London, vol. I, July 4-6, 2012. JL. Wang and C. Chen, “Biosorption of heavy metals by Saccharomyces cerevisiae: a review,” Biotechnol Adv., vol. 24, pp. 427-451, 2006. JA. Davis, B. Volesky, and RHSF. Vierra, “Sargassum seaweed as biosorbent for heavy metals,” Wate Res., vol. 34(17), pp. 4270-4278, 2000. C.P. Yingh, “Biosorption of copper(II) and chromium(VI) onto activated sludge: isotherms and kinetic models,” M.Sc. Thesis, University Sains Malaysia, Malaysia, June 2007. D.C. Barrell, “Atomic Spectrophotometer Analysis of Heavy Metals Pollutants in Water,” Ann Arbor Science Publishers Inc., Ann Arbor, MI, 1975. H. Pendias and A. Kabata-Pendias, “Trace Metals in Soil and Plants,” CRC press, Boca Raton, FL, pp. 75-86, 1992. J.K. Wagoner and U. Soffioti, “Occupational Carcenogenesis,” New York Academy of Science, p. 271, 1976. Y.B. Onundi, A.A. Mamun, M.F.Al Khatib, and Y.M. Ahmed, “Adsorption of copper, nickel and lead ions from synthetic semiconductor industrial wastewater by palm shell activated carbon,” Int. J. Environ. Sci. Tech. Autumn, vol. 7(4), pp. 751-758, 2010. C.M.A. Ademorati, “Pollution by Heavy metals,” Environmental Chemistry and Toxicology, Foludex press Ibadan, pp. 171-172, 1996. K. Schumann, “The toxicological estimation of the heavy metal content (Cd, Hg, Pb) in food for infants and small children,” Z. Ernahrungswiss, vol. 29, pp. 54-73, 1990. M. Kasuya, H. Teranishi, K. Aohima, T. Katoh, N. Horignchi, Y. Morikawa, M. Nishijo, and K. Iwata, “Water pollution by cadmium and the onset of “itai-itai” disease,” Water Sci. Technol., vol. 25, pp. 149-156, 1992. M. Yasuda, A. Miwa, and M. Kitagawa, “Morphometric Studies of renal lesions in “Itai-itai” disease: chronic cadmium nephropathy,” Nephron, vol. 69, pp. 14-19, 1995. C.D. Klaassen, “Heavy metals and Hardmen JG, Limbird LE, Gilman AG (eds). Goodman and Gilmans: The pharmacological Basis of Therapeutics,” McGraw Hill, New York, pp. 1851-1875, 2001. JM. Chen and OJ. Hao, “Microbial chromium (VI) reduction,” Critic. Rev. Environ. Sci. Technol., vol. 28, pp. 219-251, 1998. J. Godt, F. Scheidig, Grosse-Siestrup C, Esche V, Brandenburg P, Reich A, Papandreou A, Stournaras CJ, and Panias D, “Copper and cadmium adsorption on pellets made from fired coal fly ash,” J. Hazard. Mater., vol. 148, pp. 538-547, 2007. YC. Sharma, “Economic treatment of Cadmium (II)-rich hazardous waste by indigenous materials,” J. Colloid Interfac. Sci., vol. 173, pp. 66-70, 1995. K .K. Singh, A.K Singh, and S.H. Hasan, “Low cost bio-sorbent „wheat bran‟ for the removal of cadmium from wastewater: kinetic and equilibrium studies,” Biores. Technol., vol. 97, pp. 994-1001, 2006. WHO, Environmental Health Criteria 221: Zinc. Geneva, Health, vol. 11, pp. 171-176, 2001. D.M. Manohar, K.A. Krishnan, and T.S. Anirudhan, “Removal of mercury (II) from aqueous solutions and chlor-alkali industry wastewater using 2- mercaptobenzimidazole-clay,” Water Res., vol. 36, pp. 1609-1619, 2002. A. Ozturk, “Removal of nickel from aqueous solution by the bacterium Bacillus thuringiensis,” J. Hazard. Mater., vol. 147, pp. 518-523, 2007. F.N. Robertson, “Arsenic in ground water under oxidizing conditions, southwest United States,” Environ. Geochem. Health, vol. 11, pp. 171-176, 1989. F. Granados-Correa and J. Serrano-Gomez, “CrO2ˉˉ4 ions adsorption by Fe-modified pozzolane,” Sep. Sci. Technol., vol. 44, pp. 924-936, 2009. G.M. Gadd, “Metals, minerals and microbes: geomicrobiology and bioremediation,” Microbiology, vol. 156, pp. 609-643. 2010. M. AhAhemad and A. Malik, “Bioaccumulation of heavy metals by zinc resistant bacteria isolated from agricultural soils irrigated with wastewater,” Bacteriology Journal, vol. 2, pp. 12-21, 2011a. R. Ashkenazy, L. Gottlieb, and S. Yannai, “Characterization of acetone-washed yeast biomass functional groups involved in lead biosorption,” Biotechnol. Bioeng., vol. 55, pp. 1-10, 1997. N. Kuyucak and B. Volesky, “Biosorbents for recovery of metals from industrial solutions,” Biotechnol. Lett., vol. 10, pp. 137-142, 1988. H. Eccles, “Treatment of metal-contaminated wastes: Why select a biological process?” Trends in Biotechnology, vol. 17, pp. 462-465, 1999. A. Zumriye, “Biosorption of heavy metals by microalgae in batch and continuous system,” Wastewater Treatment with Algae, Wong, Y.S. and Tarn, N.F.Y. (eds. ), Springer, Berlin, 1997. Z. Aksu, Y. Sag, and T. Kutsal, “The biosorption of copper by C. vulgaris and Z. ramigera,” Environ. Technol., vol. 13, pp. 579-586, 1992. N. Goyal, SC. Jain, and UC. Banerjee, “Comparative studies on the microbial adsorption of heavy metals,” Adv. Environ. Res., vol. 7, pp. 311-319, 2003. C. White, JA. Sayer, and GM. Gadd, “Microbial solubilization and immobilization of toxic metals: key biogeochemical processes for treatment of contamination,” FEMS Microbiol. Rev., vol. 20, pp. 503-516, 1997. G.M. Gadd and C. White, “Copper uptake by Penicillium ochro-chloron: influence of pH on toxicity and demonstration of energydependent copper influx using protoplasts,” J. Gen. Microbiol., vol. 131, pp. 1875-1879, 1985. B. Greene and DW. Darnall, “Microbial oxygenic photoautotrophs (cyanobacteria and algae) for metal-ion binding,” Microbial Mineral Recovery, Ehrlich HL and Brierley CL, Ed., McGraw-Hill, New York, pp. 227-302, 1990. X. Deng and P. Wang, “Isolation of marine bacteria highly resistant to mercury and their bioaccumulation process,” Bioresource Technology, vol. 121, pp. 342-347, 2012. J.M. Modak and K.A. Natarajan, “Biosorption of metals using nonliving biomass-a review,” Miner. Metall. Proc., vol. 12, pp. 189-196, 1995. R. Gourdon, S. Bhande, E. Rus, and S.S. Sofer, “Comparison of cadmium biosorption by gram positive and gram negative bacteria from activated sludge,” Biotechnology Letters, vol. 12, pp. 839-842, 1990. Y. Nuhoglu and E. Malkoc, “Investigations of Nickel (II) Removal from Aqueous Solutions Using Tea Factory Waste,” J. Hazardous Materials, vol. 127, pp. 120, 2005. A.L. Zouboulis, K.A. Matis, and I.C. 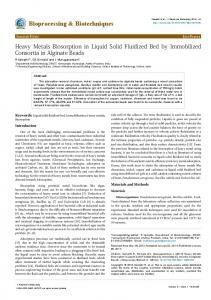 Hancock, “Biosorption of metals from dilute aqueous solutions,” Sep. Purif. Meth., vol. 26, pp. 255-295, 1997. A. Demirbas, “Heavy metal adsorption onto agro-based waste materials: a review,” J. Hazard. Mater., vol. 157, pp. 220-229, 2008. K. Vijayaraghavan and Y.S. Yun, “Bacterial biosorbents and biosorption,” Biotechnol. Adv., vol. 26, pp. 266-291, 2008. E. Romera, F. Gonzalez, A. Ballester, ML. Blazquez, and JA. Munoz, “Biosorption with algae: a statistical review,” Crit. Rev. Biotechnol., vol. 26, pp. 223-235, 2006. DR. Lovley and JD. Coates, “Bioremediation of metal contamination,” Curr. Opin. Biotechnol., vol. 8, pp. 285-289, 1997. T.A. Davis, B. Volesky, and A. Mucci, “A review of the biochemistry of heavy metal biosorption by brown algae,” Water Research, vol. 37, pp. 4311-4330, 2003. H.K. Alluri, S.R. Ronda, V.S. Settalluri, J.S. Bondili, V. Suryanarayana, and P. Venkateshwar, “Biosorption: An eco-friendly alternative for heavy metal removal,” African Journal of Biotechnology, vol. 6, pp. 2924-2931, 2007. Y. Orhan and H. Buyukgungor, “The removal of heavy metals by using agriculture wastes,” Wat. Set. Tech., vol. 28, no. 2, pp. 247-255, 1993. A.L. Zouboulis, E.G. Rousou, K.A. Matis, and I.C. Hancock, “Removal of toxic metals from aqueous mixtures. Part 1. Biosorption,” Journal of Chemical Technology and Biotechnology, vol. 74, no. 5, pp. 429-436, 1997. B. Volesky and G. Naja, “Biosorption technology: starting up an enterprise,” Int. J. Technol. Transf. Commer., vol. 6, pp. 196-211, 2007. R.H.S.F. Vieira and B. Volesky, “Biosorption: a solution to pollution?,” Int. Microbiol., vol. 3, pp. 17-24, 2000. G.M. Gadd, “Heavy metal accumulation by bacteria and oth microorganisms,” Experiential, vol. 46, pp. 834-840, 1990. A. Malik, “Metal bioremediation through growing cells,” Environ. Int., vol. 30, pp. 261-278. S.S. Ahluwalia and D. Goyal, “Microbial and plant derived biomass for removal of heavy metals from wastewater,” Bioresource Technology, vol. 98, pp. 2243-2257, 2004. B. Hemambika, M.J. Rani, and V.R. Kannan, “Biosorption of heavy metals by immobizlied and dead fungal cells: A comparative assessment,” Journal of Ecology and the Natural Environment, vol. 3, pp. 168-175, 2011. H. Mann, “Removal and recovery of heavy metals by biosorption,” B. Volesky, Ed., Biosorption of heavy metals, Boca Raton, CRC press, pp. 93-137, 1990. A. Norberg and H. Persson, “Accumulation of heavy metal ions by Zoogloea ramigera,” Biotechnol. Bioeng., vol. 26, pp. 239-245, 1984. J.S. Chang and J. Hong, “Biosorption of mercury by the inactivated cells of Pseudomonas aeruinosa,” Biotechnol. Bioeng., vol. 44, pp. 999-1006, 1994. Z.G. Eman, “Production and characteristics of a heavy metals removing bioflocculant produced by Pseudomonas aeruginosa,” Polish Journal of Microbiology, vol. 61, pp. 281-289, 2012. H. Kinoshita, Y. Sohma, F. Ohtake, M. Ishida, Y. Kawai, H. Kitazawa, T. Saito, and K. Kimura, “Biosorption of heavy metals by lactic acid bacteria and identification of mercury binding protein,” Research in Microbiology, vol. 164(7), pp. 701-709, 2013. M.M. Urrutia, “General Bacterial Sorption Processes,” J. Wase and C. Forster, Ed., Biosorbents for metal ions, CRC Press, London, UK, pp. 39-66, 1997. P. Vasudevan, V. Padmavathy, N. Tewari, and S.C. Dhingra, “Biosorption of heavy metal ions,” Journal of Scientific and Industrial Research, vol. 60, pp. 112-120, 2001. S. Iihan, M. Nourbakhsh, S. Kilicarslan, and H. Ozdag, “Removal of chromium, Lead and Copper ions from industrial waste waters by Staphylococcus saprophyticus,” Turkish electronic Journal of Biotechnology, vol. 2, pp. 50-57, 2004. 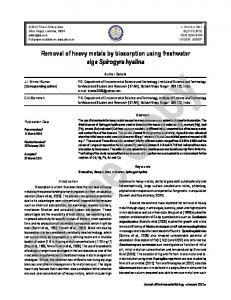 J. Jencarova and A. Luptakova, “The Elimination of Heavy Metal Ions from Waters by Biogenic Iron Sulphides,” Chemical Eng. Transaction, vol. 28, pp. 205-210, 2012. J. Suriya, S. Bharathiraja, and R. Rajasekaran, “Biosorption Of Heavy Metals By Biomass Of Enterobacter Cloacae Isolated From Metal-Polluted Soils,” International Journal of Chem. Tech. Research, vol. 5, no. 3, pp. 1329-1338, 2013. M.J. Rani, B. Hemambika, J. Hemapriya, and V. Rajesh Kannan, “Comparative assessment of heavy metal removal by immobilized and dead bacterial cells: A biosorption approach,” African Journal of Environmental Science and Technology, vol. 4(2), pp. 077-083, 2010. H. Hussein, S.F. Ibrahim, K. Kandeel, and H. Moawad, “Biosorption of heavy metals from waste water using Pseudomonas sp,” Electronic Journal of Biotechnology, vol. 7, no. 1, April 15, 2004. H.Liu, B. Chenb, Y. Lana, and Y. Chenga, “Biosorption of Zn(II) and Cu(II) by the indigenous Thiobacillus thiooxidans,” Chemical Engineering Journal, vol. 97, pp. 195-201, 2004. V. Nagashetti, G.K. Mahadevaraju, T.S. Muralidhar, A. Javed, D. Trivedi, and K.P. Bhusal, “Biosorption of Heavy Metals from Soil by Pseudomonas Aeruginosa,” International Journal of Innovative Technology and Exploring Engineering (IJITEE), vol. 2, no. 6, pp. 9-17, 2013. L. Babak, P. Šupinova, M. Zichova, R. Burdychova, and E. Vitova, “BIOSORPTION OF Cu, Zn AND Pb BY THERMOPHILIC BACTERIA – EFFECT OF BIOMASS CONCENTRATION ON BIOSORPTION CAPACITY,” ACTA UNIVERSITATIS AGRICULTURAE ET SILVICULTURAE MENDELIANAE BRUNENSIS, vol. LX, no. 5, 2012. D.P. Samarth, C.J. 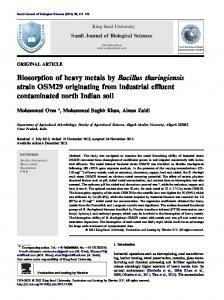 Chandekar, and R.K. Bhadekar, “Biosorption of Heavy Metals from Aqueous Solution using Bacillus Licheniformis,” Int. J. Pure Appl. Sci. Technol., vol. 10(2), pp. 12-19, 2012. R.M. Karakagh, M. Chorom, H. Motamedi, Y.K. Yuse Kalkhajeh, and S. Oustan, “Biosorption of Cd and Ni by inactivated bacteria isolated from agricultural soil treated with sewage sludge,” ECOHYDROLOGY & HYDROBIOLOGY, vol. 12, no. 3, pp. 191-198, 2012. S. Congeevaram, S. Dhanarani, J. Park, M. Dexilin, and K. Thamaraiselvi, “Biosorption of chromium and nickel by heavy metal resistant fungal and bacterial isolates,” Journal of Hazardous Materials, vol. 146, pp. 270-277, 2007. A.H. Sulaymon, A.A. Mohammed, and T.J. Al-Musawi, “Competitive biosorption of lead, cadmium, copper, and arsenic ions using algae,” Environmental Science and Pollution Research (International), vol. 20, pp. 3011-3023, 2012. M.H. Khani, “Uranium biosorption by Padina sp. algae biomass: kinetics and thermodynamics,” Environmental Science and Pollution Research (International), vol. 18, pp. 1593-1605, 2011. R. Flouty and G. Estephane, “Bioaccumulation and biosorption of copper and lead by a unicellular algae Chlamydomonas reinhardtii in single and binary metal systems: a comparative study,” Journal of Environmental Management, vol. 111, pp. 106-114, 2012. M.A. Trinelli, M.M. Areco, and S. Afonso Mdos, “Co-biosorption of copper and glyphosate by Ulva lactuca,” Colloids and Surfaces B: Biointerfaces, vol. 105, pp. 251-258, 2013. N. Kuyicak and B. Volesky, “Biosorption by fungal biomass,” Volesky, B. (editor), Biosorption of heavy metals, Florida, CRC press, pp. 173-198, 1990. J. Rincon, F. Gonzalez, A. Ballester, M.L. Blazquez, and J.A. Munoz, “Biosorption of heavy metals by chemically-activated alga Fucus vesiculosus,” Journal of Chemical Technology and Biotechnology, vol. 80, pp. 403-1407, 2005. L. Brinza, M.J. Dring, and M. Gavrilescu, “Marine micro- and macro-algal species as biosorbents for heavy metals,” Environ. Eng. Manage J., vol. 6, pp. 237-51, 2007. T.C. Wang, J.C. Weissman, G. Ramesh, R. Varadarajan, and J.R. Benemann, “Heavy metal binding and re- moval by Phormidium,” Bull. Environ. Contamin. Toxicol., vol. 60, pp. 739-744, 1998. P.S. Sheng, Y.P. Ting, J.P. Chen, and L. Hong, “Sorption of lead, copper, zinc and nickel by marine algal biomass; Characterization of biosorptive capacity and investigation of mechanisms,” J. Colloid Interface Sci., vol. 275, pp. 131-141, 2004. R.H. Crist, K. Oberholser, K. Shank, and M. Nguyen, “Nature of bonding between metallic ions and algal cell walls,” Environ. Sci. Technol., vol. 15, pp. 1212-1217, 1981. T.A. Oyedepo, “Biosorption of Lead (II) and Copper (II) Metal Ions on Calotropis procera (Ait. ),” Science Journal of Purel & Applied Chemistry, pp. 1-7, 2011. P. Lodeiro, B. Cordero, J.L. Barriada, R. Herrero, and M.E. Sastre de Vicente, “Biosorption of cadmium by biomass of brown marine macroalgae,” Bioresource Technology, 2002. K.Y. Gina, Y.Z. Tanga, and M.A. Aziz, “Derivation and application of a new model for heavy metal biosorption by algae,” Water Research, vol. 36, pp. 1313-1323, 2002. D. Sheikha, I. Ashour, and F.A. Abu Al-Rub, “Biosorption of Zinc on Immobilized Green Algae: Equilibrium and Dynamics Studies,” The Journal of Engineering Research, vol. 5, no. 1, pp. 20-29, 2008. S.J. Kleinübinga, R.S. Vieiraa, M.M. Beppua, E. Guibalb, and M.G. Carlos da Silvaa, “Characterization and Evaluation of Copper and Nickel Biosorption on Acidic Algae Sargassum Filipendula,” Materials Research, vol. 13(4), pp. 541-550, 2010. Brahmbhatt, N.H. Rinku, V. Patel, and R.T. Jasrai, “Removal of cadmium, chromium and lead from filamentous alga of Pithophora sp. of industrial wastewater,” International Journal of Environmental Sciences, vol. 3, iss. 1, p. 2, Nov. 2012. R. Ramsenthil and R. Meyyappan, “Single and Multi-component Biosorption of Copper and Zinc Ions using Microalgal Resin,” International Journal of Environmental Science and Development, vol. 1, no. 4, October 1st, 2010. V. Saravanan, Brindha, and S. Krishnan, “STUDIES ON THE STRUCTURAL CHANGES OF THE BIOMASS SARGASSUM sp. ON METAL ADSORPTION,” Journal of Advanced Bioinformatics Applications and Research, vol. 2, iss. 3, pp. 193-196, 2011. S. Subhashini, S. Kaliappan, and M. Velan, “Removal of heavy metal from aqueous solution using Schizosaccharomyces pombe in free and alginate immobilized cells,” 2011 2nd International Conference on Environmental Science and Technology IPCBEE, IACSIT Press, Singapore, vol. 6, 2011. B.S. Prakash and S.V. Kumar, “Batch Removal of Heavy Metals by Biosorption onto Marine Algae-Equilibrium and Kinetic Studies,” Int. J. Chem. Tech. Res., vol. 5(3), 2013. M. Hajar, “Biosorption of Cadmium from Aqueous Solution using Dead Biomass of Brown Alga Sargassum Sp.,” 2009. E. Romera, F. Gonza´lez, A. Ballester, M.L. Bla´zquez, and J.A. Mun˜oz, “Comparative study of biosorption of heavy metals using different types of algae,” Bioresource Technology, vol. 98, pp. 3344-3353, 2007. .I.N. Kumar and C. Oommen, “Removal of heavy metals by biosorption using freshwater alga Spirogyra hyaline,” J. Environ. Biol., vol. 33, pp. 27-31, 2012. 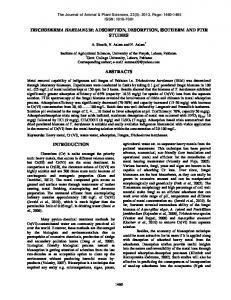 T. Viraraghavan and A. Srinivasan, “Fungal Biosorption and Biosorbents,” Springer Science + Business Media B. V., pp. 143-158, 2011. G.M. Gadd, “Interactions of fungi with toxic metals,” New Phytol., vol. 124, pp. 25-60, 1993. G.M. Gadd and A.J. Griffiths, “Effect of copper on morphology of Aureobasidium pullulans,” Trans Brit. Mycol. Soc., vol. 74, pp. 387-392, 1980. G.M. Gadd and J.L. Mowll, “Copper uptake by yeast-like cells,hyphaeand chlamydospores of Aureobasidium pullulans,” ExpMycol, vol. 9, pp. 230-240,1985. J. Remacle, “The cell wall and metal binding,” B. Volesky, Ed., Biosorption of Heavy Metals, CRC Press, Boca Raton, Florida, USA, pp. 83-92, 1990. C. Huang and C.P. Huang, “Application of Aspergillus oryzae and Rhizopus oryzae for Cu (II) removal,” Wat. Res., vol. 30, pp. 1985-1990, 1996. N. Das, R. Vimala, and P. kartika, “Biosorption of heavy metals-An overview,” Indian Journal of Biotechnology, pp. 159-169, 2008. Kogej and A. Pavko, “Laboratory experiments of lead biosorption by self-immobilized Rhizopus nigricans pellets in the batch stirred tank reactor and the packed bed column,” Chem. Biochem. Eng. Q, vol. 15(2), pp. 75-79, 2001. S.W. Hassan and H.Y. El-Kassas, “Biosorption of Cadmium from Aqueous Solutions using A local Fungus Aspergillus cristatus (Glaucus Group),” African Journal of Biotechnology, vol. 11(9), pp. 2276-2286, January 31, 2012. V.M. Mart´ınez-Ju´arez, J.F. C´ardenas-Gonz´alez, M.E. Torre-Bouscoulet, and Acosta-Rodr´ıguez, “Biosorption ofMercury (II) from Aqueous Solutions onto Fungal Biomass,” Bioinorganic Chemistry and Applications, pp. 1-5, Sep. 18, 2012. G.S. Murugesan, M. Sathishkumar, and K. Swaminathan, “Arsenic removal from groundwater by pretreated waste tea fungal biomass,” Bioresource Technology, vol. 97, pp. 483-487, 2006. 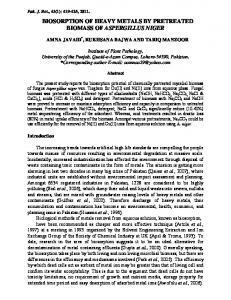 A. SHOAIB, A. NAUREEN, F. TANVEER, and N. ASLAM, “Removal of Ni(II) Ions from Substrate using Filamentous Fungi,” Int. J. Agric. Biol., vol. 14, pp. 831-833, 2012. C.Tay, H. Liew, S. Yong, Surif S, G. Redzwan, and S. Abdul-Talib, “Cu(II) Removal onto Fungal Derived Biosorbents: Biosorption Performance and the half Saturation Constant Concentration Approach,” Int. J. Res. Chem. Environ., vol. 2, iss. 3, pp. 138-143, July, 2012. S. Jha, S.N. Dikshit, and G. Pandey, “Comparative study of Growing/ Immobilized biomass verses resting biomass of A.lentulus for the effect of pH on Cu2+ metal removal,” Research Journal of Pharmaceutical, Biological and Chemical Sciences, July-September 2012 RJPBCS, vol. 3, iss. 3, pp. 421-427, 2012. C. Sutherland and C. Venkobachar, “A diffusion-chemisorption kinetic model for simulating biosorption using forest macro-fungus, fomes fasciatus,” International Research Journal of Plant Science, vol. 1(4), pp. 107-117, 2010. M.M. Parungao, P.S. Tacata, C.R.G. Tanayan, and L.C. Trinidad, “Biosorption of Copper, Cadmium and Lead by Copper-Resistant Bacteria Isolated from Mogpog River, Mari nduque,” Philippine Journal of Science, vol. 136 (2), pp. 155-165, 2007.
cerevisiae: chemical speciation as a tool in the prediction and improving of treatment efficiency of real electroplating effluents,” J Hazard Mater, vol. 180, pp. 347-353, 2010a. M.T. El- Sayed, “Removal of lead (II) by Saccharomyces Cerevisiae AUMC 3875,” Ann. Microbiol., vol. 63, pp. 1459-1470, 2013. R. Dhankhar, A. Hooda, R. Solanki, and P. A. Sainger, “Saccharomyces cerevisiae: a potential biosorbent for biosorption of uranium,” International Journal of Engineering Science and Technology (IJEST), vol. 3, no. 6, June 2006. E.-S.Z. El-Ashtoukhy, N.K. Amin, and O. Abdelwahab, “Removal of lead (II) and copper (II) from aqueous solution using pomegranate peel as a new adsorbent,” Desalination, vol. 223, iss. 1-3, pp. 162-173, 2008. P. Puranik, J. Modak, and K. Paknikar, “A comparative study of the mass transfer kinetics of metal biosorption by microbial biomass,” Hydrometallurgy, vol. 52, pp. 189-197, 2005. B. Volesky, “Biosorbent materials,” Biotechnol. Bioeng Symp., vol. 16, pp. 121-126, 2003. S-Y. Kang, J-U. Lee, and K-W. Kim, “Biosorption of Cr(III) and Cr(VI) onto the cell surface of Pseudomonas aeruginosa,” Biochem. Eng., vol. 36, pp. 54-68, 2007  G. Taghi, M. Khosravi, and R. Rakhshaee, “Biosorption of Pb, Cd, Cu and Zn from the wastewater by treated Azolla filiculoides with H2O2/MgCl2,” International Journal of Environmental Science & Technology, vol. 1(4), 265-271, 2005. A. Esposito, F. Pagnanelli, A. Lodi, C. Solisio, and F. Vegliò, “Biosorption of heavy metals by Sphaerotilus natans: an equilibrium study at different pH and biomass concentrations,” Hydrometallurgy, vol. 60, pp. 129-141, 2001. 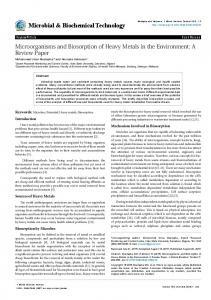 Report "Biosorption of Heavy Metals: A Review"